A bit more forward motion on the knights! Finished the trim on the second paladin and starting sketching in some livery ideas in pencil. The upper right shoulders will have a quartered yellow and white/red striped pattern, which will add a little spot color to the blue and yellow armor plates. Was able to get the second paladin assembled as well. At this point it's all detail work and basing, but the heavy lifting is done! I'd snapped a couple pics early on in the build process and apparently never posted them. 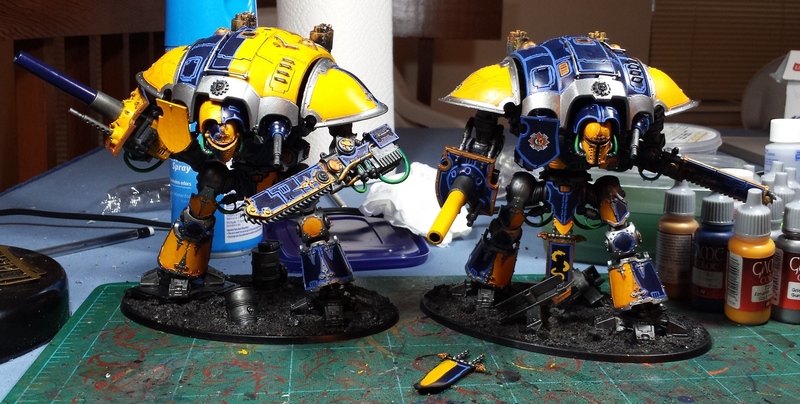 Here's a shot of the GW knight as compared with the 28mm Dreamforge Leviathan Crusader. The Crusader is significantly larger, and pretty much cements my intention of running it as a proxy Warhound (which means I need to build a second arm weapon). They're quite comparable to my BigDaddy/Blight Wheel knights, perhaps a little smaller but not appreciably so! Overall I have to say I'm in love with the GW kit, and I'm sincerely hoping that they (or more likely Forge World) end up doing some of the other variants. The codex does mention the Lancer and Castellan which gives me hope! Forge World has confirmed that the Knights will be included in their upcoming Heresy books, which I'm rather happy about. Pretty much assures that they're going to be doing upgrades/potential full kits! ...Man I'm gonna be broke! Thanks for the side-by-side comparisons; while I have a Crusader, I am still working on assembling my Knight, he he. I think your notion of using the Crusader as a Warhound is probably the best bet, and what I am leaning towards. 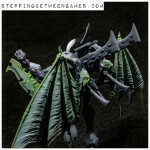 The Blight Wheel Knight is amazingly similar in proportion, a nice surprise! I too was happy to see the Lancer and Castellan mentioned in the Knight Codex, giving me hope for the future (or at least knowing that they are not completely forgotten)! I agree that FW is the likely place we will see anything in the near future. Since the arms are removable, I think there is a pretty high chance they will release some additional weapons soon. Here is to hoping! Brilliant colors mate - just love what you are doing to these. The skull/cog on the shoulder is that a transfer from the box? 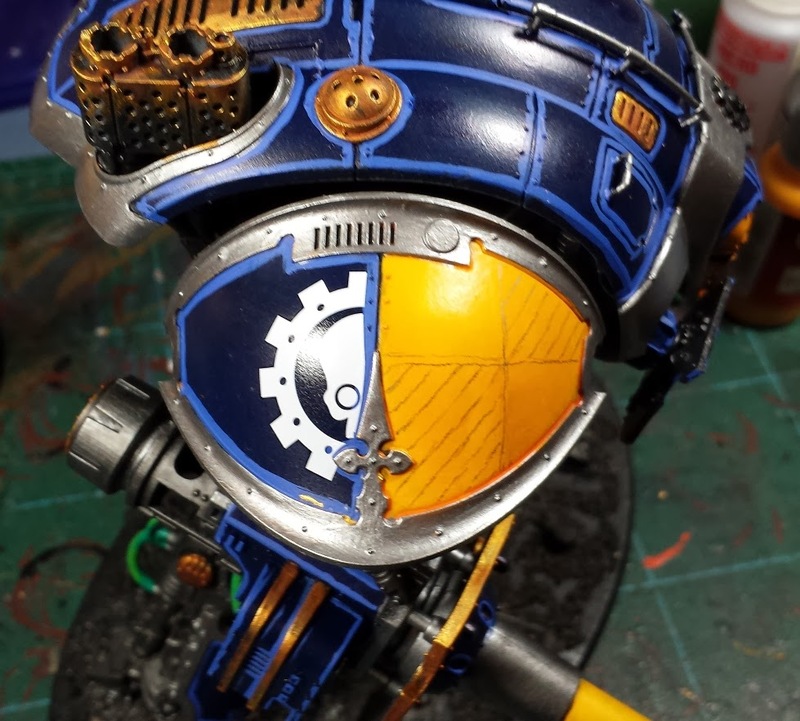 I'll have a look in the forum you pointed me to, do you know if anyone are working on finishing the TF Admech Codex? Yea, you will be broke, but you won;t be lonely with all those guys around! Oh Nice! I didn't realize you were hand painting details like that. Very impressive. And not at all surprised at the revisionist fluff. Those are striking fellows. Good stuff sir - and thanks for the comparison shots! Haven't pulled the trigger on one yet myself; how conducive does it look to cutting/bending that knee joint? I'm not a big fan of the GW stock spread-leg pose. @Eric Weir: Thanks very much! Really jazzed to see what FW comes up with for the Knights! @Zab: Hah! Nor will I have room to store any of 'em! @The Eye of Error: Yeah, going to be doing a mix of transfers and painting I think, we'll see how it goes! @Zzzzzz: I hear that. Sort of understand where they were going with the transport (it's the vehicle the orks look to make the battlewagon), but I'm just not sold on the tracks - think it would look far better with wheels! @#2501: I've carved up the knee joint and it's pretty straightforward. The challenge is going to be in repositioning the ankle, it seems. Going to have to do a fair bit of cutting and plasticard replacement. Realy a beautiful collection of kinghts ! a photo for compare the actual knight with the BWM mecha ?